When J.S. Bach completed the first collection of Preludes and Fugues that comprised the Well-Tempered Clavier in 1722, his aim was mostly pedagogical. He followed the first volume with a second about two decades later. Although compiling a collection of pieces that systematically worked through each of the 24 major and minor keys wasn’t a new idea, Bach’s Well-Tempered Clavier is by far the most famous example and spawned a number of homages and parodies over the years. Both Chopin’s 24 Preludes, Op. 28 and Dmitri Shostakovich’s set of 24 Preludes and Fugues, Op. 87 were inspired by Bach’s work. And of course, the modifier ‘Well-Tempered’ (referring to the tuning system) has also been riffed upon, as in P.D.Q. Bach’s Short-Tempered Clavier and the subject of this review: Anthony Burgess’s The Bad-Tempered Electronic Keyboard: 24 Preludes and Fugues. Burgess, like many of his musical forebears, was a fan of Bach’s keyboard music. He was also a fan of Shostakovich. I don’t know for sure if Burgess heard Shostakovich’s 24 Preludes and Fugues, but his Bad-Tempered collection and Shostakovich’s Op. 87 share a connection: Shostakovich’s work was a gift created for 200th anniversary of Bach’s death, while Burgess’s was a birthday present for the composer’s 300th birthday. Burgess composed the 24 preludes and fugues of his collection in three weeks’ time. This is quite a brisk pace, even for a man who was known to sketch out fugue subjects daily. The pieces average around 2 minutes, with some as short as 43 seconds, and two around three-and-a-half minutes. The compositional style varies throughout, with Burgess drawing upon modernist harmonies that sometimes lean towards atonality, while others weave in the wide-open sonorities of Debussy and the modal language of Vaughan Williams. Some preludes and fugues end feeling unresolved, others sit in ambiguous tonality throughout (even though they are labeled as being ‘in a key’), while others are among the prettiest and most conventional melodies Burgess ever wrote. The performer of this remarkable collection is Stephane Ginsburgh. Mr. Ginsburgh, who has collaborated with many contemporary composers, has shown himself a fine interpreter of the solo piano repertoire, but also an adventurous experimenter. He often uses a delicate touch but plays with immense confidence. In this particular collection, Mr. Ginsburgh handles each and every style variation with aplomb. The fugues of Burgess’s collection are especially well served by Mr. Ginsburgh’s pristine technique. There is a great deal of care in his phrasing, and he is able to bring out a sense of line even in the most percussive entries. The final two tracks on the album are worth an individual mention. The penultimate track is a four-voice fugue in B minor. It is one of the longest entries in the collection, and one of only two over three minutes long. Its twists and turns are unpredictable and serious, and Mr. Ginsburgh acts as the tour guide through the unfamiliar terrain. Throughout, one gets the sense that Burgess is trying to work out where the piece will end; will it stay in the modernist idiom or find its way back into pleasing and predictable harmonies? The final gambit—an unexpected ‘cha-cha-cha’—suggests that Burgess didn’t want us to get too serious about the whole thing. The final track, ‘Finale: Natale 1985’ is a fugue based on the Christmas carol, Good King Wenceslas. It’s a clever use of the tune, with Burgess showing off his ability to arrange and allude (there are other carols that briefly appear). Mr. Ginsburgh plays it straight, lending a solemnity to this bonus track that brings the collection and this recording to a close. Anthony Burgess’s The Bad-Tempered Electronic Keyboard is full of delights and surprises throughout; the composer’s eclectic influences show up in the most unexpected places. Andrew Biswell’s concise and informative liner notes provide excellent context for this collection. Mr. Ginsburgh’s adept and masterful performance is nuanced and sure-handed. This recording should be required listening for any fan of Burgess’s music. 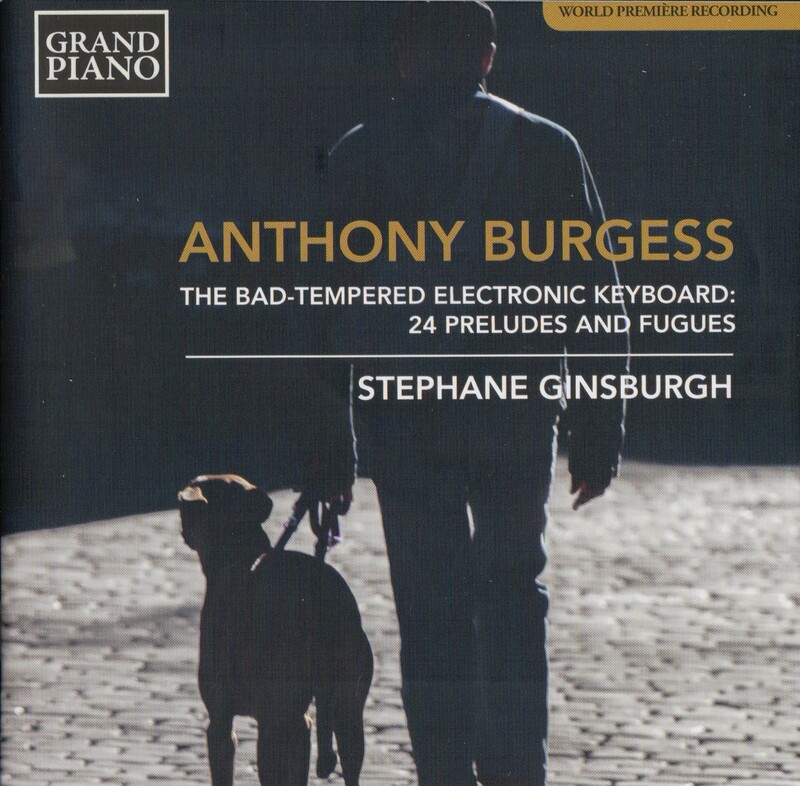 The Bad-Tempered Electronic Keyboard: 24 Preludes and Fugues by Anthony Burgess (Performed by Stephane Ginsburgh) is out now to buy, download and stream.